Something I wanted do to for while now is review Benton skin care products. 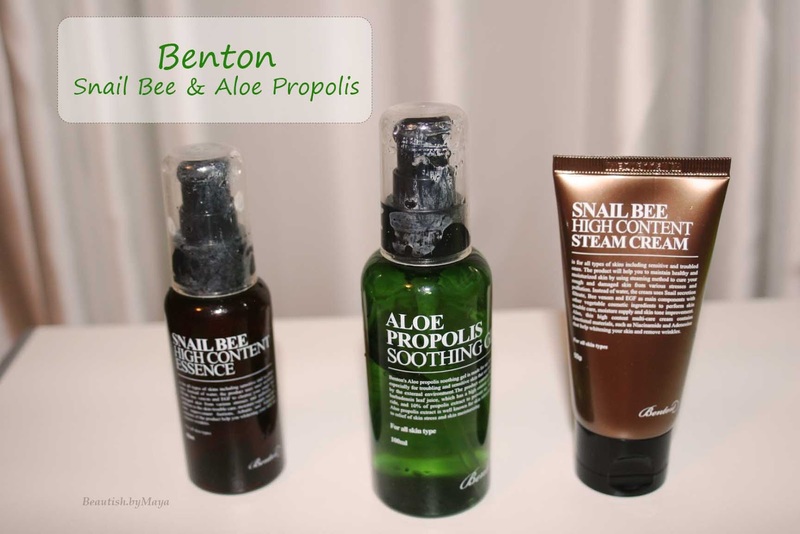 More than a year ago I was religiously using Benton, the Aloe PropolisSoothing Gel (17$), Snail Bee High Content Essence (18$), and Snail Bee High Content cream (11$), for over three months. I was at the beginning of my AB skincare journey (Korean skincare routine), before Benton I used AB trial sets and Hada Labo products. Back then my skin care routine consisted of cleansing gel + Bioderma micellar water (not AB product), Hada Labo toner, Aloe Propolis Soothing Gel, Snail Bee High Content Essence and Snail Bee High Content cream. Benton was really popular at that time, there were so many rave reviews in the AB community. Snail mucin, Aloe, Proplis, all the ingredients sounded like a magical skin saver for me especially as I suffered from blemishes and post inflammatory hyperpigmentation. I bought into the hype and purchased the above mentioned products. This was before the known issue of contamination that Benton had, otherwise I would have stayed away. I have something of a love-hate relationship with Benton. At the very beginning the products worked wonders on my skin until my skin got worse. In the first 2 weeks my skin texture improved, redness and blemishes decreased significantly. I was utterly happy until I started noticing the formation of small flesh colored bumps on my checks, that looked like milia. I must say it was really bad and it got worse every day…. This is how it looked, clogged pores, raised whiteheads, milia .? This was about the time the Benton contamination story went online, I discovered that a batch of Benton Snail Bee Essence was contaminated and some users had similar problems. My products were not from the contaminated batch, the contaminated batch according to Benton company was manufactured on 3-5-2014, my Benton essence was manufactured on 15-04-2014. 1) I used a konjac sponge at that time, maybe I didn’t clean it good enough or it was too harsh for my skin. I used the sponge especially on my cheeks, so that might explain the weird milia there. 2) The entire Benton line was to much for my skin, they might work better when used individually. The cause might have been 1, 2, a combination of both or my essence was contaminated. On subreddit/asianbeauty somebody mentioned that the reaction many of use experienced might not have been due to contamination but spoilage, Benton uses unstable preservatives, therefore, keep your products away from high temperature, preferably in the fridge. After my skin cleared up I introduced the Aloe gel and cream into my new skincare routine and observed no negative reaction. 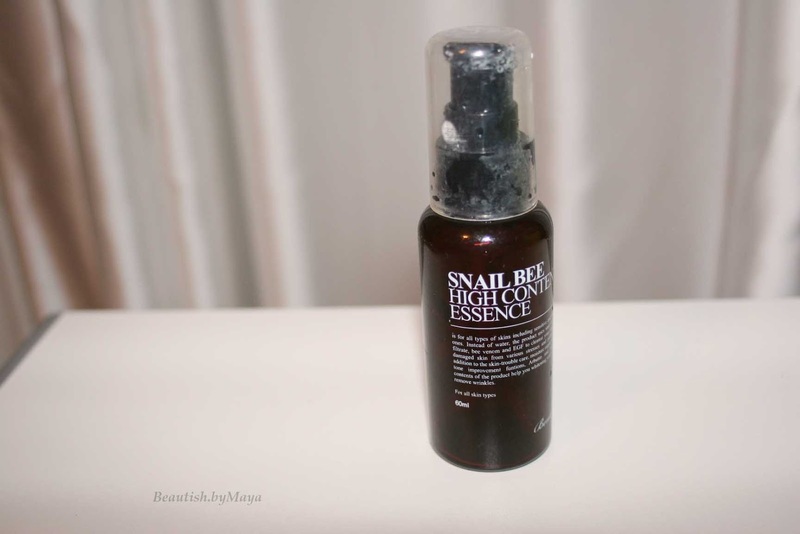 I also used the Snail Bee High Content essence and cream on occasion with no negative skin reaction. Despite the problems I had before, the Aloe gel is my favorite product. I like what the brand stands for and the products are very affordable, but please Benton please use stable preservatives. I know some wouldn’t agree with me but there has been so much talk because of the contamination/spoilage issue that I would feel safer using Benton products if they contained chemical or stable preservatives. The Aloe Propolis Soothing gel contains 80% aloe and 10% Propolis, which is known to sooth irritated skin, help fade acne scars brighten skin tone and moisturize. As with all Benton products it has 8-free system; no paraben, mineral oil, alcohol, benzophen, steroid, chemical preservatives (not sure anymore its that’s a good thing), artificial fragrance, and coloring. Both Aloe and Propolis are known skincare ingredients, that have anti-inflammatory and antibacterial properties. Running the ingredient list through Cosdna no red flags show up. The ingredient list is impressive clean! The texture is gel like and very light, if you used aloe products before you will recognize it. The gel is colorless and has no scent to it, maybe a little bit plastic like smell. It absorbs fast without leaving a residue and feels very hydrating. I like to use it as a spot treatment, for pimples and red areas but you can use it on your entire face. It’s very effective in calming and healing the skin. I burned my skin near my mouth while eating hot food, after using the gel the area healed in just one day, Impressive! It also helps calm down my mild scalp psoriasis. The gel is virtually a multi functional product. Sometimes, I have random red patches on my face and this product truly helps against them. 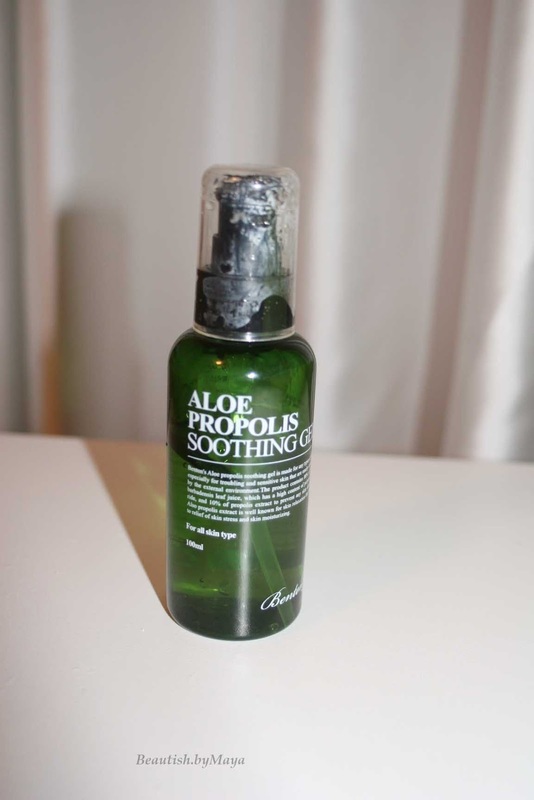 Overall, despite the contamination issue with the Benton essence I like the Aloe Propolis Soothing gel (currently my second bottle) using it as a multi functional soothing-healing gel. I would advise this product if not for the contamination issue at Benton., If you buy it then make sure it is color less and has no odd smell to it. Also don’t expose it to hot temperatures as it contains natural unstable preservatives, could oxidize very easy. Mr.Lee argued that only the essence was affected, and I didn’t experience any adverse reaction with the gel. I wish the whole Benton essence contamination story didn’t happen, then I would have loved it and repurchased it again and again. 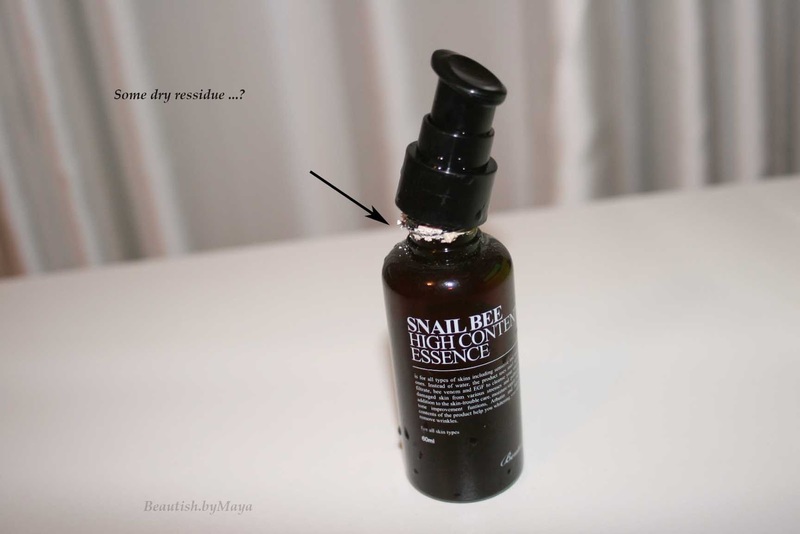 Nature republic snail products worked good on me, so I know that my skin loves snail mucin. Benton essence seemed of course superior to the nature republic one, looking at the ingredients list its entire clean without chemical actives and filters. The ingredients are amazing, all skin friendly with effective skin beneficial properties. Ingredients: Snail Secretion Filtrate, Aloe Barbadensis Leaf Juice, Glycerin, Arbutin, Human Ogliopeptide-1, Bee Venom, Plantago Asiatica Extract, Laminana Digita Extract, Dios Pyros Kaki Leaf Extract, Salix Alba (Willow) Bark Extract, Ulmus Campestris (Elm) Extract, Bacilus Ferment, Azelaic Acid, Althaea Rosea Flower Extract, Aloe Barbadensis Leaf Extract, Butylene Glycol, Beta-Glucan, Betaine, Acrylates/C10-30 Alkyl Acrylate Cross Polymer, Adenosine, Panthenol, Allantoin, Zanthoxylum Piperitum Fruit Extract, Usnea Barbata (Lichen) Extract, Pulsatilla Koreana Extract, Arginine. After what happened to my skin I’m scared to try this product again. The bottle I have was manufactured on 15-04-2015 and I used it for over three months, later I left it somewhere lying around my house. When I stopped using it, I checked it for foreign particles, smell and color to determine whatever it was contaminated. Mr. Lee claimed that only the batch off 05-03-2014 was contaminated. Mine had a plastic like scent, was colorless and the consistence didn’t look suspicious. It was difficult to tell if there was contamination. Today, when I opened the bottle it was an OMG moment. I was shocked , pink dry stuff on the top of the bottle, it looks disgusting. The smell is so horrible, like bad rotted fruit and the color is pink/yellow. This was rather caused by spoilage than contaminated, It really looks disgusting. I don’t know what exactly happened to my skin while using it, when the specialist removed all the stuff from my pores she told me it was hardened dead skin cells, similar to milia, but she wasn’t sure it was milia. It was really deep inside my pores. Strangely, only my cheeks were affected, again I think my theory 1 is correct and the clogged pores were caused by the dirty konjac sponge and not Benton products. 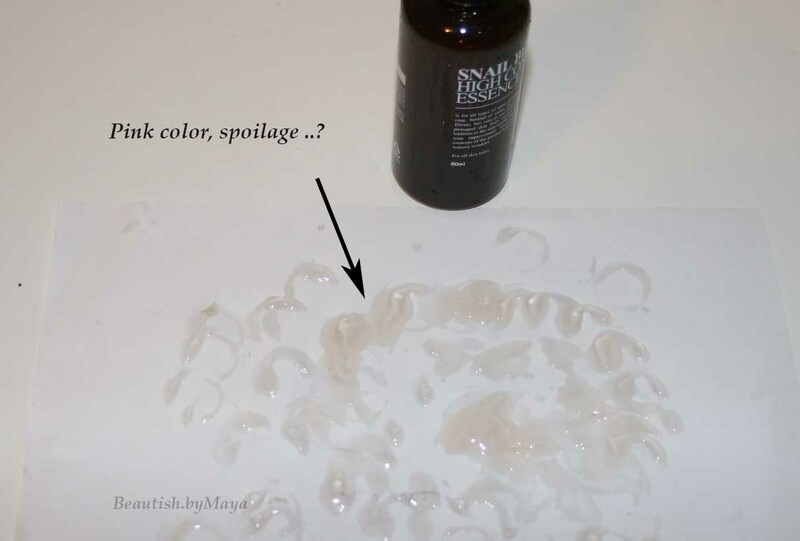 On the other hand, the essence might have been contaminated or spoiled, which became more visible to the naked eye as time passed (look at the picture) …?. This is my experience with Benton, I know it’s a while ago but I wanted to share it with you. Know you know why I have hate –love relation shop with Benton, it took me quite a while to clear up my skin. I would love to try their sheet masks, but the entire story and experience makes me stay away from other Benton products. I wish Benton would change their formulations, include some stable preservatives so we could use it with confidence. *Disclosure: This post contains some affiliate links marked with an asterix, shopping with them supports the blog. Loved your honest review. Sad to hear about the reaction of Benton essence. Hope you feel better now. Very brave of you to go back to using their products after experiencing that reaction. I wouldn't have dared coming near them again. I have acne prone skin already so I'll be keeping away from these products. I hope your skin has cleared up since then, it's such a shame when something like this happens especially if the product was working well initially! Nice to know I'm not not the only one with my crazy skin type ;) sure, it's not easy to find someone with such a similar skin type. To bad benton didn't work for you,did you experience a breakout, ? It seems now that so many of us had a bad experience with benton.how did your skin react exactly? 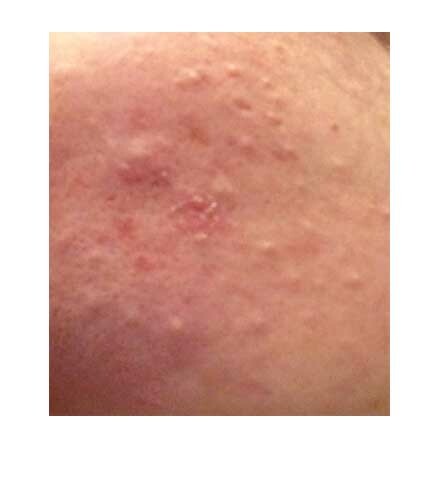 Red, breakouts or similar clogging like mine? But I'm still sorry to hear about your trouble with it and hope you recovered. Thanks for letting me know. Im curious now about the upgrade, cant wait to hear more form bloggers about it. Well i guess its since benton use less chemicals n preservative so its normal if the essence change the color because its most of the ingridients r very go green what i called. The matter is probably how to store correctly, like depends on the room's temperature maybe the essence should be kept in the fridge, or cool temperature. I guess its my opinion to think about the color change of benton essence, cmiiw.